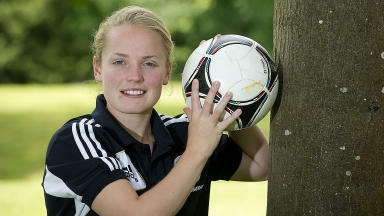 The 22-year-old Scotland star won the PFA's first women's player of year award. She started out as one of the "Mintlaw Miracles" in the north-east 15 years ago. And now Kim Little, the 22-year-old Scottish footballer, has made history by winning the PFA's first annual 'Women's Player of the Year' award. It has been a dazzling journey for Little, a gifted all-round sporting talent, who used to beat the boys at their own game, while winning all manner of prizes in her native Aberdeen. In the past 12 months, she has appeared at the Olympics as part of Team GB, scored one of the goals which helped seal a famous victory for Scotland over England, steered Arsenal Ladies to the semi-finals of the Champions League and helped the Emirates collective retain their status as Britain's best women's club. Yet, Little was as modest as ever when she was confirmed as the inaugural recipient of the PFA prize at the Grosvenor House Hotel on Sunday evening. Little said: "For years, I have watched this event on television, so to come here and win the first award is fantastic. It is a great night for me." Little typically plays as the advanced midfielder in the Arsenal line-up, but occupies a deeper role when playing for Scotland, for whom she has already amassed over 80 caps.. In an interview with FIFA.com in July 2012, Little said: "Nearly all my goals come from midfield. "That’s my natural position. But I’m a player who always tries to make forward runs, be positive and to create and score goals." The best years of her career probably lie ahead. But Little will not be satisfied until she has helped her compatriots reach the finals of a major tournament. That was why she was back at training on Monday morning. It's just the way Little is built.